lol from amnesiaproletariat over at daily kos. 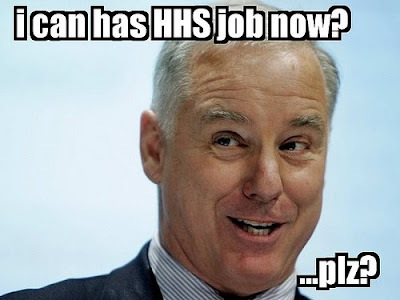 Huffpo has it that Sen. Tom Harkin from Iowa has endorsed Howard Dean for HHS. The idea of nominating Howard Dean to head up the Department of Health and Human Services has the backing of at least one prominent national Democrat. Iowa Senator Tom Harkin, who endorsed Dean's presidential campaign in 2004 and is rumored to be in the HHS running himself, applauded the idea of the former DNC header taking over the cabinet post vacated by Tom Daschle. I think that would be a very good move, Harkin told the Huffington Post. He brings all the background and experience. He's very strong on prevention and wellness, which I'm very strong on. I think he'd make an outstanding secretary of HHS. Gov. Dean would put such a positive spin on the end of this long frustrating cycle of bad news. AND he would be 100% committed to giving Americans health care. You have to remember that the health care crisis in the USA was one of the main reasons why he ran for president in 04.
cross posted from Fighting Liberals.